Go on a literary blind date. One for the Books John Jermain’s Sixth Annual Dinner Party Extravaganza will be held on Saturdays, October 13th and 20th , from 7:00 to 10:00 pm. Dinner hosts from all over Sag Harbor will select their favorite books. (The list of book titles will be available in early August.) When you choose your favorite title, you will dine with fellow book lovers at the home of the person or couple who selected the book. Join the fun, meet you neighbors and celebrate the library’s future. Call the One for the Books hotline at 631 725.0049, ext. 244 for more information. Or write to us at johnjermainlibrary@gmail.com. 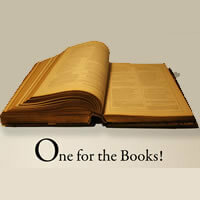 One for the Books is a fundraiser for the John Jermain Memorial Library’s Capital Campaign.